Sanjay Dutt has survived 40 years in the Hindi film industry taking on many varied roles, hairstyles and personalities. While not always a person of great virtue, he remains nonetheless a supremely popular star amongst the changing multitude of stars in Bollywood. Sanju, the new film by Rajkumar Hirani, gives audiences the chance to experience the whole story of Sanjay Dutt from Naam till Kaante and beyond. Produced under his own banner along with Vidhu Vinod Chopra and starring Ranbir Kapoor, the music for it would seem to have to be as varied as Sanjay Dutt’s own life and thus the responsibility is put in the hands of AR Rahman, Sanjay Wandrekar and Rohan Rohan. The first song Main Badhiya Tu Bhi Badhiya is parody song of music from yesteryear. Sanjay Dutt’s early career seems to have been about convincing his legendary father Sunil Dutt. With this track, Sonu Nigam and Sunidhi Chauhan wind back the clock to allow Ranbir to lip sync a song to prove his dad wrong. Since Ranbir is lip-synching both roles, Sunidhi modulates her voice to make a very funny song, which also gives a flash of remembrance for the early musical days of Bollywood. A harmonium and synth sheenai round off this melodious re-hash. This is the bedroom singer done Bollywood style and everyone seems to be having plenty of fun. Sanjay Dutt is well known for his trials and tribulations as he fought with drug addiction and rehabilitation. Kar Har Maidaan Fateh is all about the inner strength required to make it through these events. Some of the strength seems to come from Manish Koirala playing as Ranbir’s mother but it is a lot of internal fighting as Sanju seeks to rehabilitate himself. A power song with a hard hitting performance from an electric guitar for backup, Sukhwinder Singh and Shreya Ghosal give it their all. The tabla on top of a drum kit drive home the point, this song pulls no punches to add to strong onscreen visuals. Thus, the song is both a tribute to his famous mother Nargis’s motherhood and Sanjay’s own resilience. What Bollywood film could do without a song about the loss of love? For Sanju, Ruby Ruby is that song. There is a mysterious opening with a background chorus that is barely audible. Ruby Ruby is a song of desperation: there is a want and need for Ruby. Backed up by electric guitar, drums and bongo for flourishes, there is almost anger at the apparent loss of Ruby. In true Sanjay Dutt style there are no tears shed, but Ruby seems to be getting away from him. The tones of loss are clearly felt within the song but at the same time it never sinks into a full depression. On the lighter end of things, we have Baba Bolta Hain Bas Ho Gaya. Papon, Supriya Pathak and Ranbir Kapoor give us a satirical look at Sanju’s personal issues with the celebrity media. Ranbir’s lyrics/dialogue give an insight into Sanjay Dutt’s lack of privacy during his darker times while Papon and Supriya Pathak sing around him as if in a musical conversation. 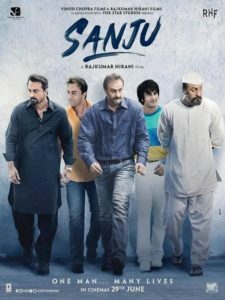 While this is a very serious topic, it’s easy flow balances different voices, none of which seem to stand out or are over the top and with a jazzy background there’s plenty of fun to be had from this point for both the audience and in Sanju’s life. It’s easy flow balances different voices, none of which seem to stand out over the top as if in conversation and with a jazzy background there’s plenty of fun to be had from this point in Sanjay Dutt’s life. To bring the noise we have Nakash Aziz with Bhopu Baj Raha Hain. This is all about screaming louder than the rest of the world to let loose and break free. A vibrant latin dance beat is given rhythm and melody through a variety of loud brass instruments. Nakash is asked to sing over the top of these and succeeds. His voice is very suited to this and the song certainly is a fun go at letting go of all tensions. The final song in the soundtrack is a sultry cool jazz number Mujhe Chaand Pe Le Chalo. Sung by Nikhita Gandhi it sounds to be a combination of a cabaret style track mixed with a deep love song. It seems to encompass everything that Sanjay Dutt’s personal life is known for: take me to the stars, break me free from the pain of the world, give me love without making a sound. It has an engaging power without ever seeming to get above a whisper and yet its mystery keeps dragging the listener back in. Many people live fascinating lives to become famous in their own fields, upon which often films are made about them generally after their passing. Yet Sanju is still here with us, is part of all the promotional material for the film and is still actively making films himself. So even when writing songs for this, its important to remember that the songs must be fit for the purpose of the film and the story it tells. There is no doubt each song has been clearly chosen for a purpose while still fitting into the standard 6 song format Bollywood has adopted in the 21st century and yet each song seems to have its own little twist or touch to make it worth listening to again and again. 15 queries in 0.420 seconds.